not be being exposed to poisons without suitable protection. * I refer in this post to both fair trade and FairTrade™ - the first is the concept, the second is a certification system. Confusing, but there you are. **the International Labour Organisation makes a distinction between 'child labour' and 'child work'. 'Child work' is work that doesn't interfere with their education or affect their health - like the paper run I did as a kid. 'Child labour' is work that goes beyond that. I'm OK with 'child work', but not 'child labour'. I know that if I buy goods with the FairTrade™ logo or buy my goods from TradeAid, then they will meet those conditions. However, a new fair trade certification has now come to my notice: "UTZ certified". It's used mostly for cocoa, coffee and tea at this stage, but is gradually widening its scope. In a market-based economy such as our own, co-ops are a rarity but we still manage to have rules that ensure labour conditions aren't too bad. Why should we insist on co-ops for cocoa producers rather than simply requiring decent labour conditions? Requiring the whole product to be made of FairTrade™ ingredients (should they exist) makes it quite ifficult to migrate to FairTrade™. Kiwi chocolate manufacturers frequently cite having to use FairTrade™ sugar as a major barrier to converting their range to FairTrade™. And why should they? Sugar grown in Queensland (their current main source of supply) is surely grown without coercion, child labour or unsafe use of pesticides, so what is the logic in having to by-pass it to bring in FairTrade™ sugar from Costa Rica? Of course, chocolate-makers could simply use FairTrade™ cocoa on ethical grounds, but there would be no way for them to advertise that they were doing so and hence no market incentive for it. Or, they could do what KitKat has done globally and use UTZ-certified cocoa. This doesn't give them a prominent FairTrade™ label on the front, but it does give them a sizeable UTZ flag on the ingredients list - quite easy to spot if you're looking for it. So, is UTZ any good?? On the whole, I think it is. I think that workers on a FairTrade™ plantation are likely to have better working conditions than those on a UTZ-certified plantation (because they have access to a FairTrade™ premium and earn a guaranteed minimum price for their produce), but I think that the working conditions for workers on the UTZ plantation will be good enough. Safety training of workers in their own language. Access to decent housing, clean drinking water and health care for workers and their families. *They further expand on what is meant by the living wage concept in general terms here and in more detail here. Basically it means that the workers must receive sufficient compensation to be able to access decent housing, food, transport and other essential needs such as health, education and water. Frankly, this is a lot better than what many workers in New Zealand receive. These conditions seem to mean that a UTZ-certified ingredient has been produced by people who have been treated well in the terms I outlined at the beginning of this post. However, it's not 100% clear to me whether workers growing UTZ-certified ingredients will have earned a decent wage: unlike the other conditions, the living wage conditionis only required to be achieved "within a reasonable period of time" (source). That's not necessarily unreasonable, but, given that UTZ is a pretty non-transparent certification, it does make me a little nervous. Not requiring farms to be co-ops, though, makes the pathway for moving from 'regular trade' to fair trade much clearer under UTZ than FairTrade™, meaning that there is probably a much wider scope for uptake. For example, Haigh's chocolates in Australia were recently able to move to UTZ cocoa without changing their suppliers - surely a win for those workers. So, in the future, if products we want are available from TradeAid or under the FairTrade™ logo, I think Martin and I will preferentially buy those. They seem to be better certifications. However, if products we want aren't available that way but are available using UTZ-certified cocoa, coffee, tea* or bananas (the things we buy exclusively fair trade), then we'll be comfortable buying them. UTZ is good enough for us. * for tea, we actually usually buy Dilmah - we trust their ethical claims. So, what fair trade possibilities does that open up for us? 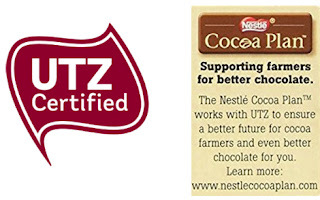 A full list of products that we are aware of that use fairly traded cocoa (both UTZ and FairTrade) is here. The official UTZ list is woefully out of date, so we'll try to keep ours updated as we are able. This is really good to hear. I'm a firm believer in respecting the realities of "getting there from here", not just defining your ideal and expecting things to somehow magically change. I see you mention Dilmah's claims. Could you do a post on this sort of thing? It seems to be popular with chocolate manufacturers, as well as tea and no doubt other products. Why do they do it, what would it take to move them to FairTrade(tm) or UTZ? And how should I evaluate their claims - do you have a checklist or suggestions? I may do a post on the Dilmah thing etc. some day, but here are some initial thoughts. 1. It would be extraordinarily complicated for Dilmah to transition to FairTrade(TM), because that certification requires the growers to be a co-op. Dilmah owns their own plantations, so that would involve changing their whole company structure from a privately-owned family business to a co-op (or splitting the growing arm off and doing that with that portion only). Dilmah is very unusual in being a company that both owns plantations and markets in the West, but the problem of needing to be a co-op would remain for any plantation company. That's one of the big things I like about UTZ: you don't have to be a co-op, so Dilmah could make that transition if they wanted. 2. Dilmah, doesn't actually *want* to be fair trade certified - there's stuff about that on their website. Basically, they think that what they offer their workers is actually better than what any of the fair trade certifiers require (in particular, because their goods are fully processed and packaged in Sri Lanka, keeping lots of the value there). So they are trying to build an image of themselves as being super-ethical, and feel that joining a certification would weaken that. 3. In terms of how to evaluate claims in general, I'm not sure. I trust Dilmah partly because they're enormous: I figure that, were their claims to be untrustworthy, that information would get out, in this hyper-connected age. I have never found anyone saying that they've found their claims to be untrue. I also have the advantage that someone from our church used to work in a senior role at their NZ importer: he had colleagues who had visited the plantations and had been very satisfied with what they'd seen. 4. I'm not very familiar with claims like the one in the website you linked to. My first step in evaluation would be to look at what they actually claim, and match that against the checklist I gave at the beginning of the blog post. In the statement you linked to, there's nothing about eliminating child labour (my biggest concern with regards to the cocoa industry), so that would rule them out for me. If they claim to meet the checklist's requirements, you then need to decide if you trust them. An internet search would be a good start - has anyone else found them untrustworthy? But, in general, I'm hesitant to buy uncertified goods from a small company as it's so hard to be sure. I'd go with a certified thing unless they were people I knew personally or knew people who knew them or something. But, most ethical claims that I've seen would fall down on comparison with my checklist: like, both Whittakers and Cadbury's in NZ have made statements about how awful they think child labour is, but they haven't actually made any claims about doing anything to keep it out of their supply chain.